I came across a very cool Instant Messaging app for the iPhone last night. You may have heard of Meebo before ? 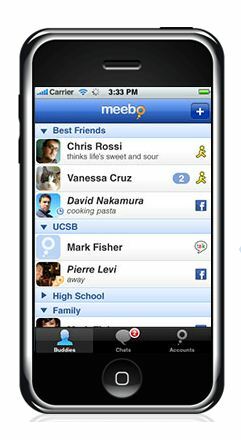 Meebo started out as a web-based instant messaging platform, which allowed you access your IM services like MSN, AIM or Google talk, amongst others, from a web-based interface anytime, anywhere. 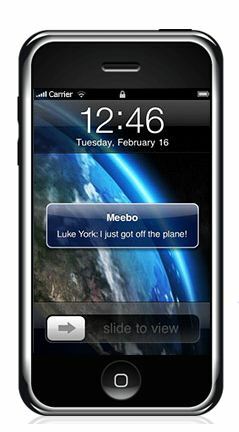 Meebo have now launched their latest offering, the Meebo iPhone app (iTunes Link). The app, which is free on the app store, is one of the best IM clients I have used on the iPhone. I have played around with a few of the other offerings including IM+, and the simplicity of Meebo outweighs the other apps. Meebo also offers Push notifications for when you are out of the app. So if you start chatting with someone, and close the app, if they start chatting with you, it will send you a push notification to let you know they have sent you a message.The app also syncs with the Desktop or web version and keeps a full chat history. So far, for me, Meebo is the best chat app I have used on my iPhone, and could soon find its way to being on the home screen on my iPhone.